Here on our little piece of Montana paradise we grow all of the vegetables we eat – except for the occasional farmer’s market purchase of Brussels sprouts. We have had horrible luck growing them. To grow enough vegetables to can and freeze to meet our needs for a year and to have put aside in the case of a bad planting season takes a lot of hard work on the part of the hubby. It’s something he truly enjoys though and he looks forward to his garden every year. In the first couple of years he would prepare the rows for planting with his rototiller but he learned that it was better for the soil to do it with a broadfork so that is what he does now. He was out over the weekend preparing the first row for planting and putting in the first seeds of the season! Each year he rotates where each crop grows so that crops that drain the soil of nutrients like the corn aren’t always in the same place therefore causing damage. The very first thing he does is pull off the cover of mulch he had placed at the end of last season; that’s when he finds out how the garlic has fared. 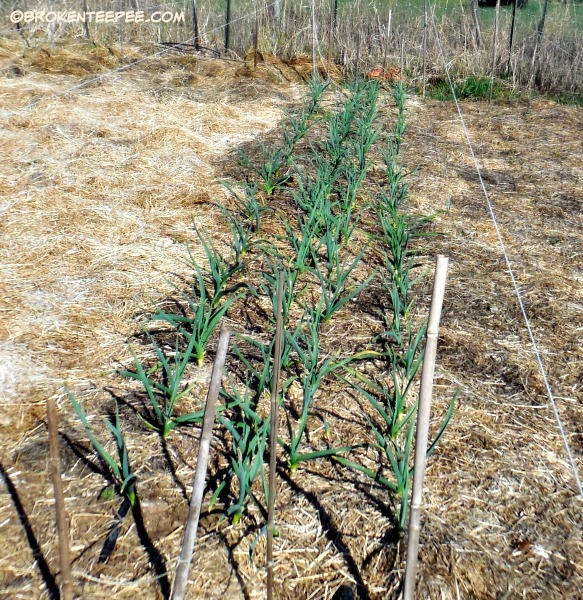 Garlic goes in to over-winter and as you can see it is doing very well. Last year we had close to 40lbs between two different varieties. I had more than enough garlic to see me through the year to say the least. 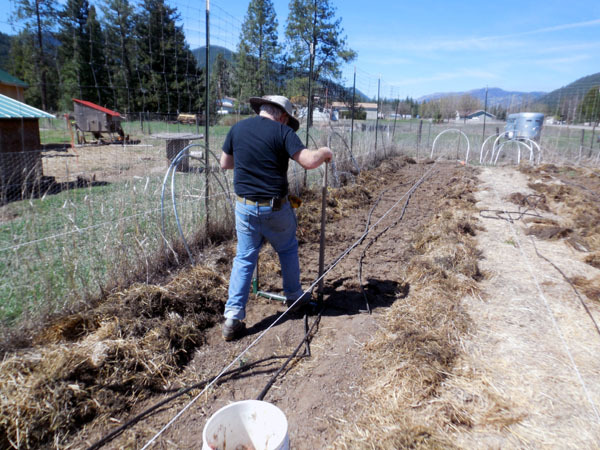 He set up his stakes for all of the rows in the garden but only used the broadfork on the one he was going to plant. He planted spinach, lettuces, beets and carrots. All of these can handle the still close to freezing mornings we are having. I know I can’t wait to have fresh lettuce again. That first salad always tastes so good. You can see the drip irrigation system in the animation above. He loves this way of delivering water to his garden and has one on the berry garden as well. It uses far less water that other systems and it delivers the water where it is needed. 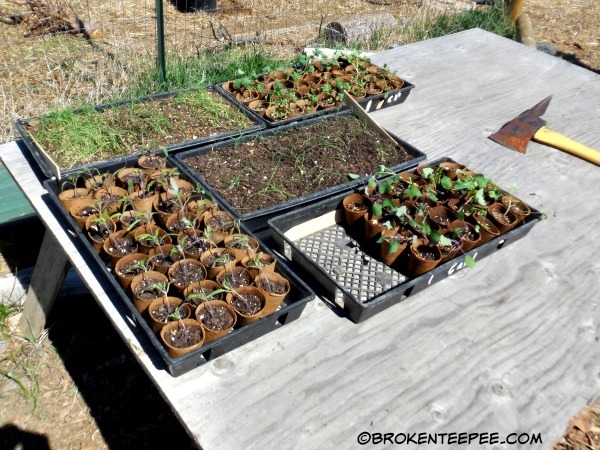 He has also been taking advantage of our warm afternoons to acclimate his seedlings to the outside world. He brings them out and has them sit in the sun for a few hours each day – it’s called “hardening off.” Or so he says. I’ll have to take his word for it ’cause he’s the gardener! I know I won’t be eating any fresh vegetables for months but I also know that when I do they will be delicious! There will be a lot of work ahead for both of us but the payoff is a summer of warm from the garden veggies and a freezer and pantry full of organic produce. So stay tuned and follow along with each step of our garden. Are you planning to grow any vegetables this year?